Here are 11 developments of interest to fans. The costumers actually handed out 1,200 Superman suits in all shapes and sizes, but only 867 people showed up for the final count, WorldRecordAcademy.com reported. The UK gathering smashed a record of 556 people in Superman costumes set at Sears Headquarters in Chicago just a few weeks ago. (2) Syfy reaped a publicity bonanza with Sharknado. Now they’re throwing more sharks at the wall and hoping they stick. Look forward — or any direction you think best — to Ghost Shark on August 22 starring Mackenzie Rosman (7th Heaven’s Ruthie Camden). A great white shark is tortured and killed by a fisherman, then returns from the dead, exacting vengeance on all humans. (3) Nine states still can’t find their souvenir Apollo 11 moon rocks despite a search that has lasted more than a decade. The fate of moon rocks NASA gifted to Alabama, Louisiana, New York, South Carolina, Texas, Utah, Virginia and Wisconsin are still unknown. Hawaii’s was rediscovered after it was stored in a cabinet in the executive chambers of the state capitol building. Minnesota’s moon rocks had been put away with military artifacts before being found and transferred to the state’s historical society last year. Nebraska’s display was lost in the governor’s mansion until building renovations resulted in the moon rocks resurfacing. And then there was the case of Alaska’s Apollo 11 lunar sample display, which disappeared in 1973 after a fire tore though the museum where they were on exhibit. In 2010, they re-emerged in the possession of a reality TV star, who tried to sue the state to gain legal title to the moon rocks. He ultimately surrendered them. The Guardians Of The Galaxy footage was stunning, action packed, and filled with humor. With some brief Comic-Con footage, Guardians Of The Galaxy went from that Marvel property that no one had ever heard of to being one of their most anticipated feature films. In fact, it could be argued that no one won bigger at Comic-Con than Guardians Of The Galaxy director James Gunn, because Guardians Of The Galaxy probably had the least buzz going in, but the most buzz coming out. (5) The Famous Monsters of Filmland booth ranked #10 on JoBlo’s list of coolest booths at Comic-Con. “I thought this could work in America if done right,” Warren said. Warren borrowed $2,000 to publish what became Famous Monsters of Filmland and even posed on the cover of the first issue in a Frankenstein mask because he could not afford more than one model. Famous Monsters sold out in three weeks and soon began inspiring young readers such as Roy Thomas, a former editor-in-chief at Marvel Comics. Sixty years ago Bazooka Joe—the iconic character created by a Long Islander—debuted in a little strip wrapped around pieces of Bazooka Bubble Gum. Last November, Bazooka Candy Brands—a division of Topps (the company behind so many sports and other trading cards)—announced that they would no longer include Bazooka Joe inserts with their bubblegum, citing decreasing sales. 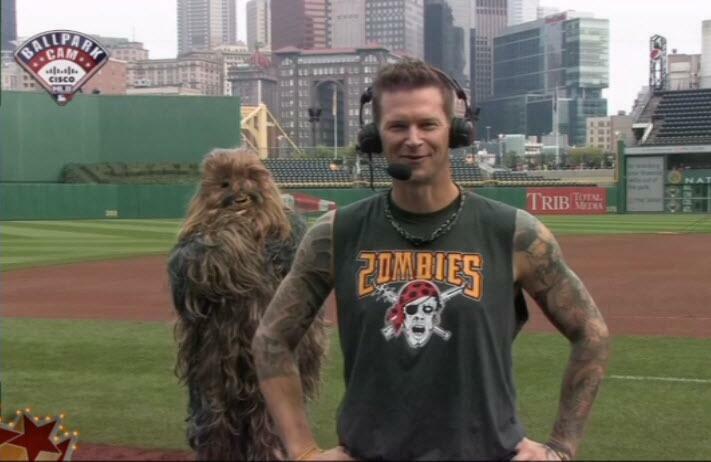 (8) A very short Wookiee photobombed Pittsburgh Pirates pitcher AJ Burnett during an on-field interview July 31. (9) Anne Serling, author of a recently published book about her father, Rod Serling, creator of Twilight Zone, is interviewed by The Twilight Zone Podcast. There’s not much difference between regular English soccer fans and the undead variety in “Cockneys vs. Zombies”: Even when expired, they’re still ready to rumble with anyone wearing the colors of a rival team. And that’s pretty much the point of this spirit-of-the-Blitz comedy from Matthias Hoene. Filled with East End grit and “EastEnders” escapees, the ragtag story is merely an excuse to remind us, all too emphatically, that Londoners won’t lie down. So when a zombie horde is loosed from a 17th-century vault by two startled construction workers, its chomping progress is less terrifying to residents than galvanizing. [W]riter/co-producer Simon Kinberg, producer Lauren Shuler Donner, producer Hutch Parker, and actors Omar Sy, Ellen Page, Shawn Ashmore, Anna Paquin, Halle Berry, Ian McKellen, Patrick Stewart, Hugh Jackman, James McAvoy, Michael Fassbender, Jennifer Lawrence, Nicolas Hoult, Peter Dinklage, and Evan Peters. This entry was posted in Snapshots by Mike Glyer. Bookmark the permalink. Yes, there definitely has to be a Broadway musical with Hugh Jackman singing and dancing as Wolverine. The idea is too awesome to not happen. Here’s Buzzfeed asking if Hugh Jackman is Wolverine or if Wolverine is Hugh Jackman as they reprint a photo of him deadlifting 463 pounds, so much weight that the bar is bending in the middle as he lifts it. So we have another James Gunn to keep track of? We already had the prominent astronomer Prof. James E. Gunn of Princeton University and the novelist, scholar, and SFWA Grand Master Prof. James Gunn of the University of Kansas. 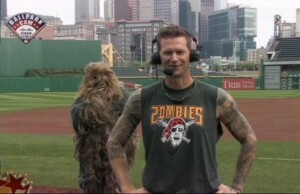 Oh, well, I suppose with care we can keep them straight. I would be the last to suggest that America has too many Gunns. Hear, hear! Mancini conducting Peter Gunn theme.